On the way to Cardiff games. Taken on the “Roma” (Liner). Both finalists in foil, McCreath taking silver medal. Both found romance overseas and married. Lost to Australian fencing. L-R: Tim Owen, ? ?, George Foenander, ?? L-R: Jill Wellstead, Linda Hancock, ?? L-R: Caroline Katel, Sally Blandford, Megan ?, Wendy Kemp, Pam Heraudes, Maree McGregor, Sue ? I am in desperate need to contact george henry foenander, i have some extremely important family information for him. please contact me on 0409 025 542. My name is Amy Spicer. I am really hoping to make contact with George Foenander – there is some vital information I can only discuss privately with him – I would appreciate a reply as soon as possible. Hello Mike and former fellow fencers. Memory Lane indeed. My own five children have thus far given me five grandchildren. As my youngest are only 17 and 12, I dare say the tribe will increase in the years ahead. Odd how they could never get your surname right – often Sandford and even – as I vividly recall – one letter addressed to Sister Sapfoot! I’ve just found the site too, thanks to an email from Mike. It is terrific to see the photos (I still have some of these!) and to be in touch. I now have 10 grandchildren (!) 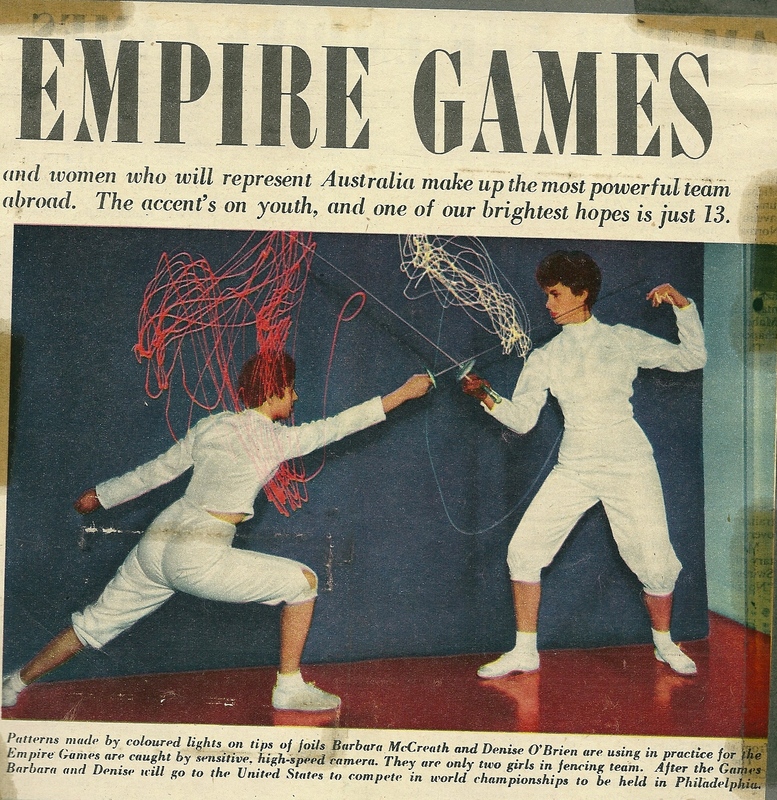 one of whom, aged 7, occasionally makes noises about being a fencer – which I encourage. This site will be a big help. 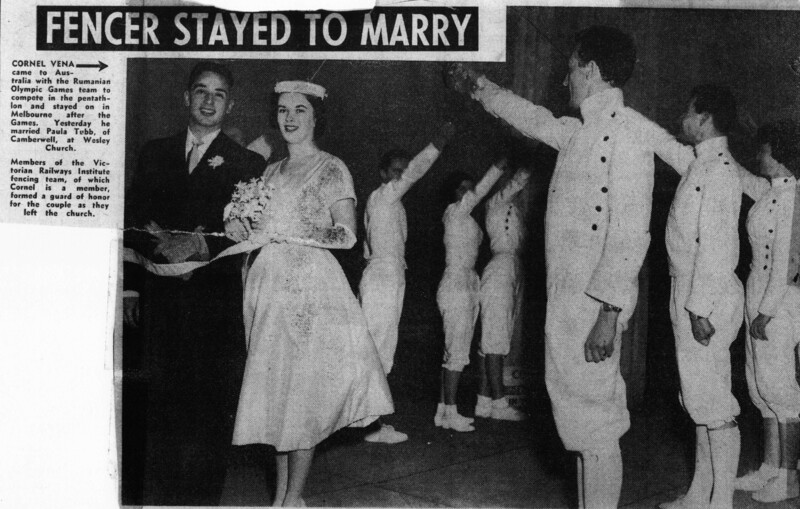 Hi, I have a friend, Rob Stansen, who has always claimed to be involved with the 1956 Olympic Fencing team. He was not fencing for the team but may have had a support role? Hello, I am trying to obtain more information on Barbara McCreath, to whom I believe I am related by her Mother’s line. Could anyone help me in confirming if her father was Ronald Walker McCreath, her mother being Henrietta (nee Stokes) . I believe she attended a school in Perth whilst her parents lived in Malaya until moving to Australia in the 1950’s. Any help appreciated, even confirmation that this is not the same lady. Very many thanks for checking, and also for such a lovely informative website. Shame I cannot claim Barbara as a family member, such a talented lady. I will try and give her a call / drop her a line from the UK when I have a moment.